Hibs have received a six-figure sum thanks to striker Jamie Maclaren’s stint with Australia at the 2018 World Cup in Russia during the summer. The on-loan Darmstadt forward was part of Bert van Marwijk’s squad, but didn’t see any action at the tournament as the Socceroos bowed out at the group stage. FIFA’s Club Benefits Programme has allocated a sum of £105,723 to the Easter Road side as a result of the 25-year-old’s involvement with the national team. Maclaren, who initially joined on loan in January, scored eight times in 13 outings for the Capital club in the second half of last season, including a hat-trick against Rangers on the final day of the season. 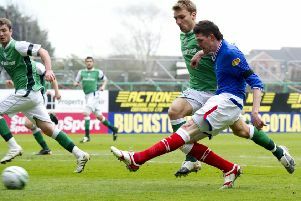 He also scored against Hearts and Celtic as Hibs finished strongly and qualified for Europe. Aberdeen, Celtic and Rangers also received a financial boost with the Dons banking £70,482 for Kari Arnason’s involvement with Iceland. Celtic pocketed £1.054m thanks to the involvement of Dedryck Boyata, Mikael Lustig, Tom Rogic and Cristian Gamboa, while Bruno Alves’ spot in the Portugal squad landed Rangers £161,120.